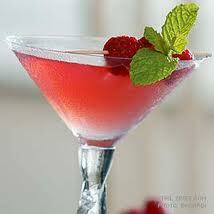 Muddle the raspberries in the bottom of a martini glass. Combine the raspberry vodka, cointreau, pineapple juice, cranberry juice and lime juice in a shaker. Tip: When I serve these at a party, I make a pitcher of Flirtini “mixer” (raspberry vodka, Cointreau, pineapple juice, cranberry juice and lime juice) ahead of time. Then guests can pour the “mixer” in their glass, and add the champagne and raspberries themselves! This entry was posted on Friday, January 28th, 2011 at 12:03 am and is filed under . You can follow any responses to this entry through the RSS 2.0 feed. You can leave a response, or trackback from your own site.